"It says I can't connect to your game. I can join your party, though." Now, taking a phone call when you've got a headset on already is always amusing, and this was no different- I started offering Jason some advice on router settings (he was on a new network, after all), and eventually Nick started paying attention. 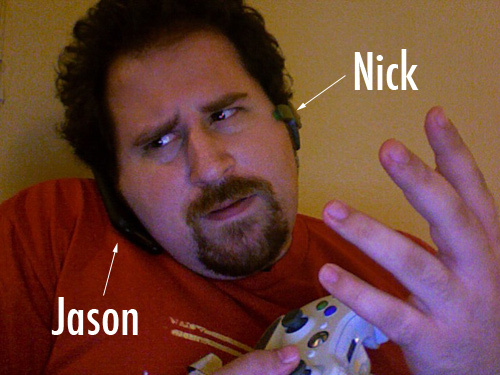 We ended up having a technologically-advanced game of "telephone" going: Jason would inform me that his Xbox wasn't cooperating, I would repeat any relevant info to Nick, and so on. This went back and forth for some time, before we discovered that support for Jason's router was discontinued in 2007, agreed that some Google-fu was in order on his part, then said goodbye to him and finally started to play our Legendary campaign, with a few too many skulls turned on for good measure. You know what? It worked. Postscript: Jason eventually got Xbox Live working again, proving that life DOES give us a happy ending every once in a while. Halo 3: ODST Sells 2.5 Million, Halo 3 Sequel Hinted, Reach Details, and More Halo! Page created in 0.2254 seconds.